I know, it's been a while since my last post, but I have a good excuse for my silence. It was my XYZ Birthday last week :). Usually, I don't cook on my birthdays, my family takes me out to a nice restaurant and we have decent food and plenty of drinks, talks, laughs, etc. This year was an exception, I bravely decided ( What was I thinking !?!?!) to celebrate my coming to this world and my passion for cooking simultaneously, with cooking a four-course meal dinner for my family. Sounds crazy, doesn't it? I would say that was the star in the menu. I prepared the crab meat salad and gazpacho salsa ahead of time. The avocado salsa though, had to be prepared close to the time of serving, otherwise the avocado gets darker. 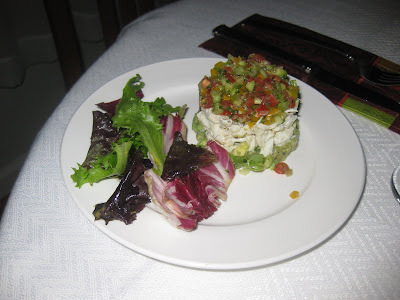 This appetizer was spectacular, the combination of crab meat and the creaminess of the avocado and the freshness of the gazpacho salsa were perfect. 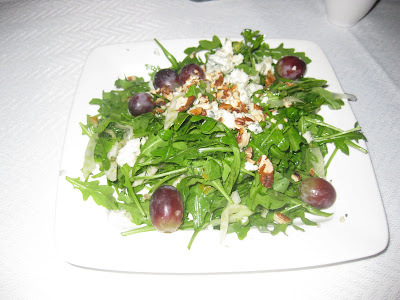 The dish was not very labor intensive, easy to prepare and serve! I'd make it again! Nice salad, I sliced the fennel and prepared the dressing a few hours ahead, and just put everything together before I served it. 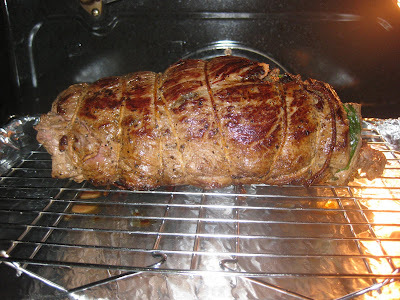 I stuffed, rolled and tied the beef the day before and only seared and roasted it before serving. It came out nicely and my family liked it but...I didn't think it was that spectacular. There were a few pieces left and I tried it again last night.. I think I like it cold better. Next time, I would cook this in advance and just warm it before serving to avoid all the commotion from doing all the prep and cooking at the last moment. Another point, I bought a high-grade meat for this dish, and probably cooking Filet Mignon would've showed the meat better. Until this point everything was pretty much in control and served on time. But there was Potato Roesti in my menu, and that was way too ambitious. The recipe called for shredding the potatoes with food processor and then squeezing them as dry as possible. I did the shredding in advance and squeezing and drying just before cooking. I made two pancakes, and each took about 20 minutes to cook, a bit longer then I could afford at that time. By the time the roesti was ready the beef was not that hot, not to mention the fire alarm that got activated from the smoke :) ... So next time I would opt for potato pure, for sure. I made the cake the day before. 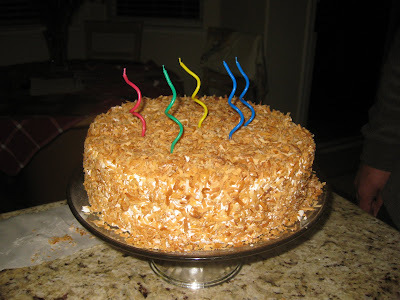 The recipe was good, the cake was moist and tender, the coconut flavor was deep yet subtle at the same time, overall not very sweet. My only objection was the amount of butter used in the traditional butter cake and the buttercream icing. Next time I'd look for a different filling and icing. Busy with last minute cooking, I forgot to take out the cake from the fridge and at the time of the serving it was quite cold. So generally speaking, the cooking adventure went well, good experience, with few surprises here and there. My big struggle was the timing and my main mistake was, that I chose dishes I never cooked before. I did not dare to adjust, or shortcut the processes that could jeopardize the quality. Thanks god I have this loving, supportive, and appreciative family. They were with me through the whole endeavor and made it fun and pleasure! I have to say that everything was amazing! 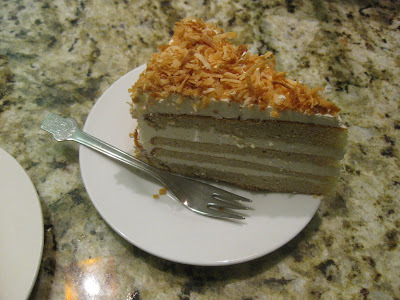 I still dream about the crab tower and fantasize about eating two slices of the decadent coconut cake in one sitting --- ooooh! I am really sorry you had to go through all that stress, especially on your B-day, but if it is of any comfort, let me tell you that we were blown away by your execution of each dish. The crab meat towers were amazing, the arugula salad very fresh and flavoful, and the beef was really tender and nicely balanced with the mushrooms and spinach. I know i am not a beef connoisseur and do not really like the tase of bloody raw beef, but this one was perfect! The potato pankakes were also delicious, and the bread rolls could not be any better. Also the cake was great, and i actually liked it cold because the filling tasted more like ice cream. We are really greateful for all your efforts and for the good times spent with you! I know perfection runs in your family, and I can tell you that everythig was PERFECT! Mmmm, everything looks delicious! 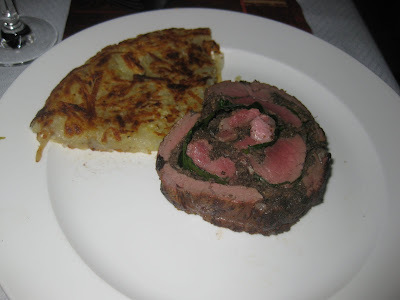 I've made the Roast Beef Tenderloin with Caramelized Onion and Mushroom Stuffing from Cook's Illustrated and it looks like yours - I'm not sure if it's the same recipe you used, but that one is amaaaaaazing. This food looks soooo good!